Looking for a fun day-trip or weekend getaway? 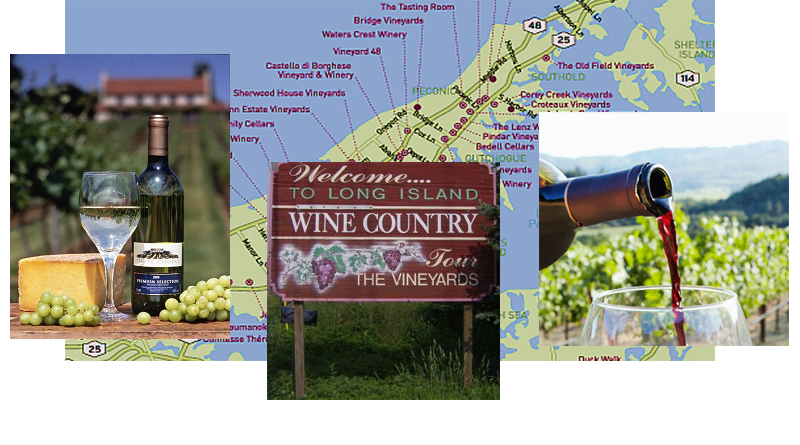 Why not go on one of our Long Island Wine Tours? We have the expertise to arrange full day Coach Bus tours to Wine Country to some of the most interesting vineyards. We take pride in offering so many options that can be planned into your trip. Give us an idea of what your group enjoys and what they have enjoyed in the past and we will provide you with side tours as well as “Party Tours” that include a full day and night fun for all. We will arrange everything to avoid waiting on lines and providing the venues for restaurants that do not disappoint. Our team is experienced and matched up to your group and will be as involved as you wish, as these are people who truly enjoy what they do. Check out the prime wine country of the Northeast on a trip to explore the vineyards of the North Fork. With several tastings at the vineyards of your choice, paired with artisan dishes at some of our premier and well known restaurants, with a great over view of the charms of Long Island. Leave the home behind you as you ride out to a totally different world that you probably never knew existed on Long Island! Your first stop will usually be at an older more established Italian varietals. These are winemaking techniques that have been passed down for generations that started in Italy. These vineyards are just so beautiful so sit back and enjoy the ambiance that makes the whole trip worthwhile. If desired, lunch will be provided for you and your party to enjoy at the Vineyard of your choice during our Long Island Wine Tours, or you can choose a wonderful meal at the many fine restaurants the East End has to offer. We will even reserve your seating, leaving you and your guests with only one responsibility, to Eat & Enjoy. The East End of Long Island is a Beautiful Place, where there are many activities to take pleasure in year round Tastings & Long Island Wine Tours. Here at JD’s Limousines, we can handle all arrangements necessary to create the perfect day for your choice of Long Island Wine Tours. Our relationship with East End businesses makes it easy for us to handle any and all accommodations you are looking for. If you choose JD’s Limousine’s Long Island Wine Tours, feel free to take detours for fresh produce, as well as reservations for the many eateries is just a few of the many options our clients receive. Our calendar of events in our Long Island Wine Tours allows clients the choice of attending the many harvests, festivals, and wonderful concerts that are common to the East End. For more information on our Long Island Wine Tours East End Packages or to make a Reservation please call JD’s Limousines at (516) 849-6420 for our Long Island Wine Tours today. Take a tour of Long Island’s wineries in the relaxed comfort of one of our limousines or buses. Our wine tours take you to Long Island’s East End, where you can revel in the beautiful scenery, and sample wines direct from their makers. All vehicles Owned & Operated by JD’s Limousines Inc.
Tastings: Winter hours Thurs. – Sun. 11:00 p.m. -5:00 p.m.
Tastings: in Summer daily 11-5pm, Fri & Sat 11-6pm. Tastings: 11AM-5PM Mon.-Fri.; 11AM-6PM Sat. & Sun. In Winter closed on Tues. & Weds. Tastings: 11:30AM-5:30PM Sat. & Sun. Tastings: 11:00AM-5:00PM Mon-Fri.; 11-6PM Sat. & Sun. JD’s Limousines is a professional business located in Oceanside, Long Island, New York. We provide professional transportation services for you, door to door with courteous and professional chauffeurs.